UPDATE: Live coverage of the dedication is on hold as the proceedings are postponed due to impending impact from Hurricane Irene. CNN Domestic has released its coverage plans of the Martin Luther King Jr. National Memorial dedication in Washington, D.C. scheduled for this Sunday. Coverage will include the broadcast of the dedication ceremony live, as well as two documentaries. Details from CNN below. CNN Press Release: CNN’s chief political correspondent and anchor Candy Crowley, anchor T.J. Holmes and anchor and special correspondent Soledad O’Brien will anchor live coverage of the Martin Luther King Jr. National Memorial dedication in Washington, D.C., on Sunday, August 28th. Also reporting from the memorial will be D.C.-based correspondent Athena Jones. Beginning at 6 a.m. (ET), Holmes will anchor CNN Newsroom from Washington, D.C. From 9a.m. to 1p.m. (ET), Crowley anchors a special edition of State of the Union. CNN’s coverage of the dedication ceremony will begin at 11 a.m. (ET). CNN will broadcast Freedom’s Foot Soldiers: A Conversation with T.J. Holmes Saturday, August 27at 7:30 p.m. (ET). 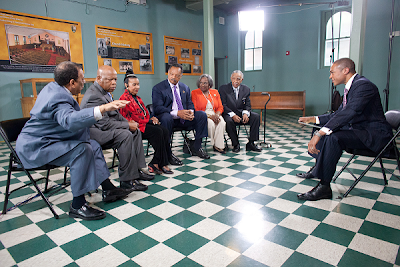 Holmes exclusively interviews Dr. King’s friends together in the basement of Ebenezer Baptist Church in Atlanta to reflect on the life of Dr. King and the Civil Rights Movement then and now. In the very revealing, sometimes emotional interview with Juanita Abernathy, Xernona Clayton, Rev. Jesse Jackson, U.S. Representative John Lewis (D-GA), Rev. Joseph Lowery and former U.N. Ambassador Dr. Andrew Young, these “living legends” spoke of Dr. King’s desire to quit the movement and concentrate on writing and preaching, and the message the monument sends. On Sunday, August 28 at 8 p.m. and 11 p.m. (ET), CNN will air the documentary MLK: Words That Changed A Nation, reported by O’Brien. For this documentary, O’Brien interviewed Dr. King’s closest confidants, including Dr. Young, Rep. Lewis, and activist Dorothy Cotton, for their behind-the-scenes insights into many of the historic events of the Civil Rights Movement of the 1950s and 1960s. They discuss the arrest of Rosa Parks, Dr. King’s win of the 1964 Nobel Peace Prize and Dr. King’s time in a Birmingham jail for his participation in a nonviolent protest for civil rights. MLK: Words That Changed A Nation includes an examination of Dr. King’s private library of papers, letters, and speeches that reveal his personal philosophy and theology, as well as his doubts and fears – as he and those around him created a peaceful revolution that forever changed America. Leading up to this historic memorial dedication, CNN will broadcast coverage through the day, entitled Building the Dream beginning Thursday, August 25, with interviews from the witnesses of the assassination of Dr. King; a conversation with the survivors of the 16th Street Baptist Church bombing (an attack that killed four girls in Birmingham, Alabama); a sneak peek of the collection being compiled for The National Museum of African American History and Culture; a look at the women behind the Civil Rights Movement; and the personal side of Dr. King from the eyes of his driver and personal assistant Tom Houck.